Samsung might still be doing damage control following the cataclysmic discontinuation of its flagship Galaxy Note 7 device, but this isn’t stopping the company from releasing new phones. Today, the manufacturer unveiled its revamped Galaxy A lineup, featuring significant improvements in both design and performance. The series will arrive in three different models, including the smaller-sized 4.7-inch A3, the standard 5.2-inch A5 and the larger 5.7-inch A7. Among other things, the brushed up phones will feature USB-C connectivity, enhanced IP68 water resistance, as well as supercharged 16MP front and rear cameras. Much like the Galaxy S7, the IP68 waterproofing certification guarantees that in addition to withstanding the ingress of dust, the Galaxy A series should survive being submerged in up to five feet (or approximately 1.5 meters) under water for a duration of up to half an hour. Besides sporting a dedicated shutter button for quick selfies, the boosted front and rear cameras will also offer better performance in low-light conditions as well as faster autofocus capabilities. Unlike the A5 and the A7, the A3 will come with slightly less powerful cameras – a 13MP shooter at the back and an 8MP camera at the front. More intriguing is the move towards USB-C. While for now the reversible USB-C port will allow easy connectivity as well as Fast Charging, this decision could be the harbinger of a much larger trend. Samsung has been continuously rumored to be contemplating doing away the headphone jack and switching to USB-C is a logical first step. Still, we’ll probably have to wait a little longer for this. As far as design goes, perhaps the most significant change is the speaker grill, which is now on the right hand side of the device. 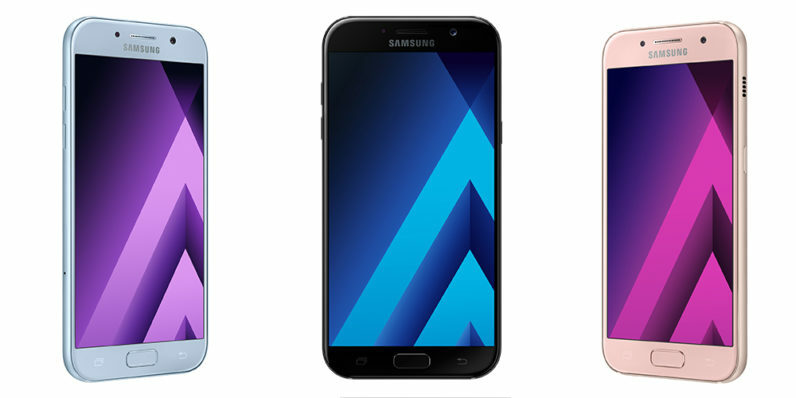 While the Galaxy A lineup will retain its hybrid metal and glass design, the glass cover is curvier in comparison with last year models. The South Korean giant says the Galaxy A series will launch in Russia in early January, with plans to expand shipping to global markets shortly after. Although the price remains unclear, the phone will be available in four color options, including Black Sky, Gold Sand, Blue Mist and Peach Cloud. Head to the official press release for more details and full specs.